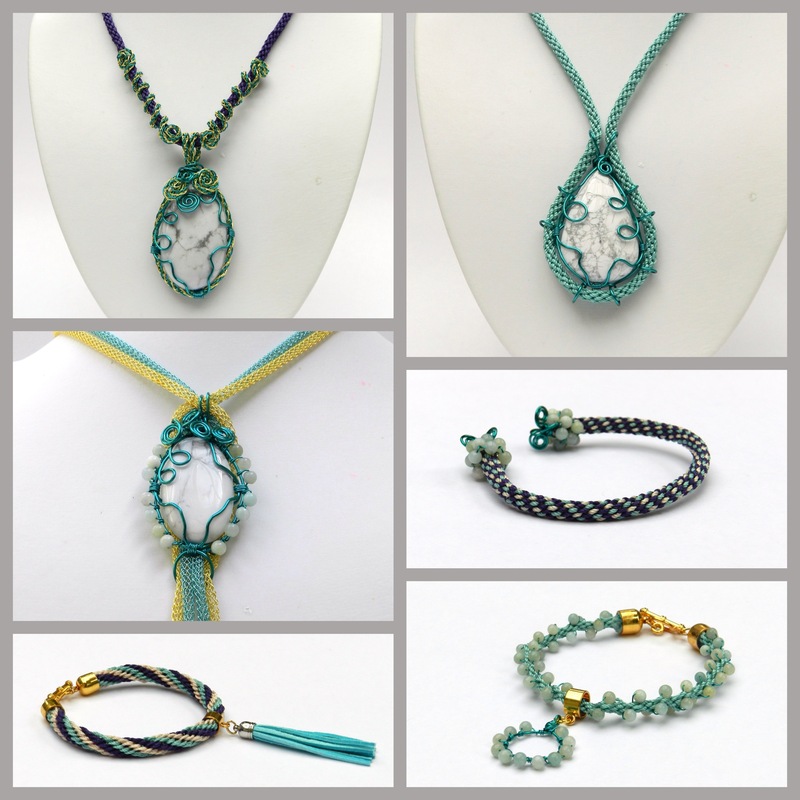 On 30th June I demonstrated some jewellery designs combining cabochons, wire and kumihimo. 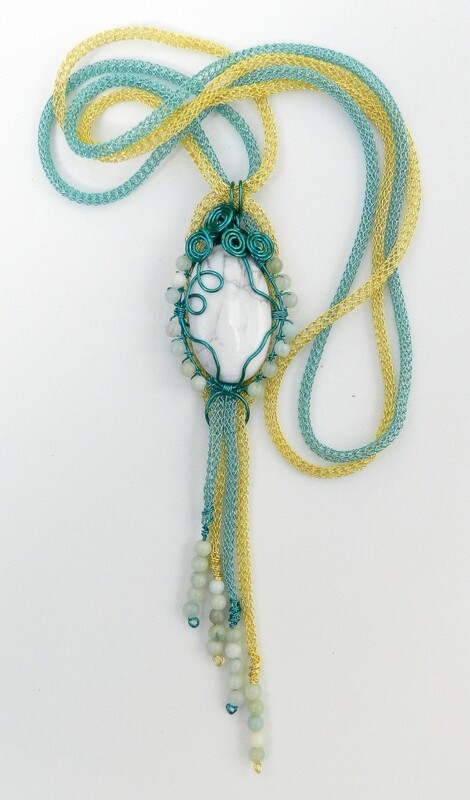 The kit I was using also included some pretty Amazonite 4mm rounds, knitted wire, tassels, thick S-Lon and findings. The wire was 0.8mm and 0.4mm. The show can be seen here. There are many brilliant tutorials for the basic wrapped cabochon available on YouTube, so I am not proposing to provide detailed instructions here. As every cabochon is different it is not possible to give exact measurements for the wire. Wire will stiffen and become brittle with repeated manipulation. Try to be as gentle as possible when braiding the wire and do not bend the finished braid too many times. I demonstrated how to braid wire on the show. 1. First braid the 0.4mm wire. Use 4 lengths of 1m in gold and 4 lengths of 1m in turquoise. Position one colour at north and south and the other colour at east and west on the disk. The braid structure is Round Braid. This amount of wire should leave plenty of braid spare to make hoop earrings to match. 2. Use a 25-35cm length of wire braid and 2 x 25-35cm of 0.8mm wire to wrap the cabochon, using the braid as the centre wire. Please refer to the recording of the show for the method. Form the bail with the wire braid and make sure that the bail is large enough to accommodate the braid. 3. The braid is made using 1 – 1.2m lengths of cord, depending on required length. 4. To make the coiled braid to decorate the sides of the braid cut 2 x 16cm. Make a spiral at either end and coil the wire braid around the cord braid. Thread on the pendant and complete the second coiled braid. This design is made in much the same way as a standard wrapped cab, but loops are formed on the middle wire before the cab is wrapped. Make the braid first, using 8 x 1 – 1.2m S-Lon. Make sure that the loops are large enough to accommodate the braid before wrapping the cab. Thread the braid through the loops and separate the bail to thread the braid through different sides. This design could be made with kumihimo braiding instead of the knitted wire. This design is also made in much the same way as a standard wrapped cab, but a large loop is formed in the centre of the middle wire and 4mm round beads are wired onto the middle wire before the cab is wrapped. The bail needs to be large enough to accommodate 4 lengths of braid or knitted wire. The necklace is designed to be long and slip over the head without the need for a clasp. The knitted wire or braids are threaded through the loops at the top and bottom of the cab. If using the knitted wire it can be flattened with pliers to ensure that it lies flat. If using braid, try either flat braid or a fairly thin braid. 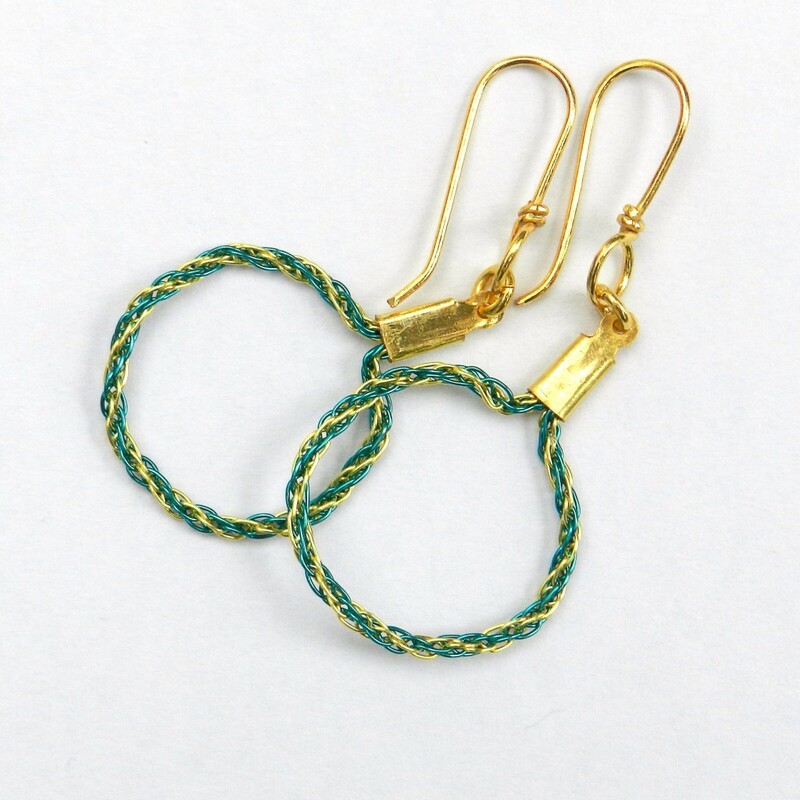 Use the excess wire kumihimo braid to make earrings. Use a mandrel or pen to form the hoops and secure the ends in fold over ribbon clasps. Attach earring hooks. 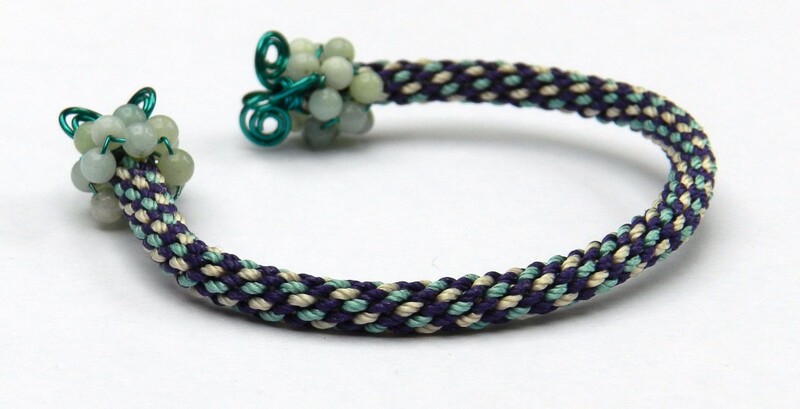 Use 12 warp Round Braid for this bracelet, with 2 cords per slot. Position the same colours opposite each other on the disk. A wire core is used to make this bangle. Use Round Braid around a core of 4 lengths of 0.8 mm wire. When the braid is complete undo the initial knot and glue the braid securely onto the wires at either end. Cover the two glued sections with a beaded bead (15 beads, ladder weave, 0.4mm wire) and keep them in place by forming spirals in the ends of the wire.